Gerlitzen – tourist attraction for the whole family in the heart of Carinthia. Let us bring you at 2.000 m above sea level and you’ll be captured by the unique landscape. Rustic alpine cabins pamper you with traditional dishes. A special jaunt is guaranteed! The idyllic Lake Ossiach is Austria’s third biggest lake, and located in one of the most pleasant regions in Austria perfect for some unforgettable hours afloat! It takes you only ca. ten minutes from Lindenhof to the lake. In addition to the possibilty to discover the lake by navigation, you can rent your own boat or swim through the lake by visiting the public bathing beach. Just like in the free nature: an unforgettable animal experience is awaiting you on the monkey mountain Affenberg. You will find yourself with no barriers in the world of 152 macaques. The primary aim of the eagle show is to let people have a closer approach to birds of prey and owls and to transmit some knowledgeable facts about them. In a demonstration, lasting about 45 minutes, you will experience our free flying birds of prey. Enjoy the spectacular view and panoramas of carinithian mountains and lakes during a unforgettable paraglider-tandemflight! You like horses? So you must visit the “Glis Ranch” that is located below the Lindenhof. Go for a ride and enjoy the fun at the horse’s back. You have a lot of possibilities to do sports around the lake Ossiach – one sport is probably tennis. Only a few minutes on foot from Lindenhof you’ll reach the “Tennis Center Annenheim”, where you can play tennis (indoor and outdoor). Beeindruckende Architektur erwartet Sie im Steinhaus in Steindorf am Ossiacher See. In diesem eindrucksvollen Bauwerk von Architekten Günther Domenig finden laufend Workshops statt, welche Sie besuchen können. Außerdem werden von Mai bis Oktober Führungen angeboten, wo Sie das Haus von einer ganz anderen Seite entdecken können. Founded in the eleventh century and extended during the baroque period, Ossiach Abbey lies on the shores of Lake Ossiach, surrounded by the scenic mountains of Carinthia, Austria’s southernmost province. It was here that the Carinthian Summer Music Festival came into being in 1969, a festival now ranking among the most important in Austria. Since 1972, Villach, the Carinthian city most Mediterranean in character, has been the Festival’s home away from home. You can visit more than 100 destination without paying any Euro - everything for free! 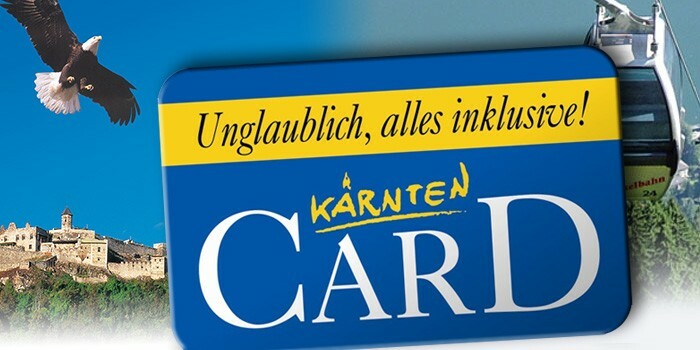 The "Kärnten Card" makes it possible.